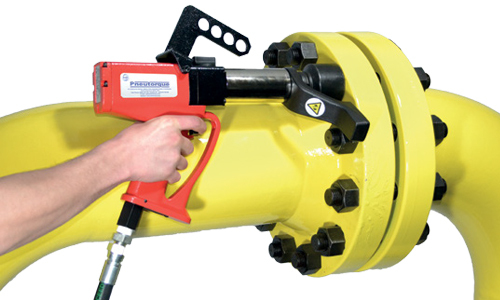 KBSS can access the Norbar Pneutorque Pistol Grip Pneumatic Wrenches to provide a smooth, safe for the user to operate due to non-impacting, low vibration levels and continuous output drive, which can be controlled using an air pressure regulator, called the Lubro Control Unit. The air pressure can be set to stall out with a repeatability of +/- 5% on any given joint. This tool one of the most lightweight and fastest tools with exceptionally compact diameter of the gear box means that the tool is well balanced and provides excellent access to bolts. When rented an accompanying package is provided which includes a filter lube control, inter-connecting hose and a Peli Protection Box, as well as its own calibration certification and pressure torque graph.